The picture that accompanied the "Mars Spectacular" email of 2003, which sparked the recurring Mars Hoax. Sorry, skywatchers: Despite what you may have heard, Mars won't look as big as the moon overhead tonight (Aug. 27). The "Mars Hoax" has been popping up every Aug. 27 since 2003, when it was born in a widely misinterpreted email. The unknown sender of that message was trying to get people excited about an unusually close approach of Mars to Earth in late August 2003. "The encounter will culminate on Aug. 27 when Mars comes to within 34,649,589 miles (55,763,108 kilometers) of Earth and will be (next to the moon) the brightest object in the night sky," one paragraph of the email reads. "It will attain a magnitude of -2.9 and will appear 25.11 arc seconds wide. At a modest 75-power magnification, Mars will look as large as the full moon to the naked eye. Mars will be easy to spot." Unfortunately, many people glossed over the "at a modest 75-power magnification" part and ran with the notion that the moon would have a big, red rival in the sky. This myth persists, despite repeated debunking stories here at Space.com and in numerous other media outlets. 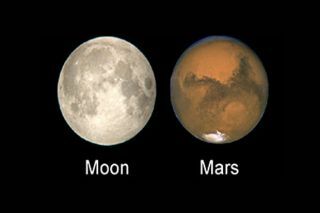 In fact, Mars can never appear as large as the moon in the night sky. The Red Planet is about twice as wide as the moon and would therefore have to get within about 476,000 miles (766,000 km) of Earth — twice the Earth-moon distance — to be moon-sized to the naked eye, as Space.com skywatching columnist Joe Rao noted last week. Mars' orbit, of course, keeps the Red Planet tens of millions of miles from us at a minimum. So what will Mars look like in the sky tonight? In a word, ordinary. The Red Planet is about seven times farther from Earth, and about 70 times fainter in the sky, than it was in August 2003, Rao wrote. You might even need binoculars to find the fourth planet from the sun tonight.